NOW OPEN: Get up to 4 WEEKS FREE + Call for Additional Special Offers! So, you’ve just settled into one of the apartments near Inverness Business Park in Denver and are ready to expand your wardrobe. There’s nothing quite like some new clothes to go with a new home, but do you know where to go to find the best deals and goods in the area? Like any city, there’s an awful lot to choose from. Denver is home to some of the nation’s best premier shopping destinations, and living in Englewood places you within arm’s reach of all of them. Consider this the shopaholics guide to this amazing neighborhood. Next door in Greenwood Village lies The Landmark, home to one of the highest rated shopping centers in the city. With luxury retailers like A Line Boutique and HW Home, you can find just about anything your heart desires here. Plus, there’s plenty of fine dining locations where you can grab a bite to eat in-between stores. You can find The Streets just a few blocks away in South Glenn. This plaza is filled to the brim with quality discount stores like Ross, Marshals, and Macy’s. You can also stop in at the Whole Foods Market and take care of groceries while you’re here. Delicious eats and premier outlets are what awaits you at Aspen Grove. This shopping complex is located just south of Englewood in Littleton, which you could walk to if you wanted to. Food options range from Chick-Fil-A to the ever-popular Noodle Company, but the stores are what really draws in the crowd. Major names like Eddie Bauer, Fab’rik, and Evereve line the streets while prominent brands such as Hallmark and Lane Bryant fill the space in-between. Stop in at Kirkland’s for some unique home décor or have your portrait taken professionally at Portrait Innovations. Whatever you do, get ready to shop your heart out. Located right in Englewood, this is your stop for bargains galore. Start With Stein Mart, where you can find everything from kitchenware to dresses and gadgets. Aside from their usual sales, they also have an excellent clearance section. You can also find plenty of second-hand children’s goods at Once Upon a Child, as well as drugstore items at Walgreens. While the shopping isn’t incredible, the pampering is. Get your car washed at the Corner Store then treat yourself to a manicure at the Lush Nail Bar. Afterwards, grab a Frappuccino from Starbucks before heading to your next destination. Head into the heart of the city and you’ll find Larimer street, the hub of all shopping hubs. Nearly every street number on Larimer is a boutique, store, or outlet. As for what you can find here, the possibilities are endless. Men can stop into Al’s Barber Shop for a clean cut in a classic atmosphere, visit Goorin Brothers for an authentic craftsman hat, then fill out there wardrobe with fine apparel from Moda Man. Ladies, there isn’t a closet large enough to fit the wide variety of shoes from Scarpaletto, no vanity that can contain the amount of antique jewelry from Victoriana, and no better way to relax in-between stores than Wax + Lash. Stop into Quinti for a unique selection of Peruvian clothing made from the finest materials, or head into Hailee Grace for something more contemporary. John Fluevog has you covered on out-of-the-box shoe designs, while John Atencio has the contemporary jewelry you’re looking for. There’s also Element for modern home décor, but a must stop shop for any dog lover is the Dog Savvy Boutique. This is where you can pamper your pet with a spa day of their own while shopping for fine-quality pooch products. Finally, no shopping trip is complete without a little addition to your beauty regimen. That’s what Aillea is for. You can find more on Larimer Street, but that ought to suffice for an entire day or more of shopping. This is the absolute best shopping spot in all of Denver. 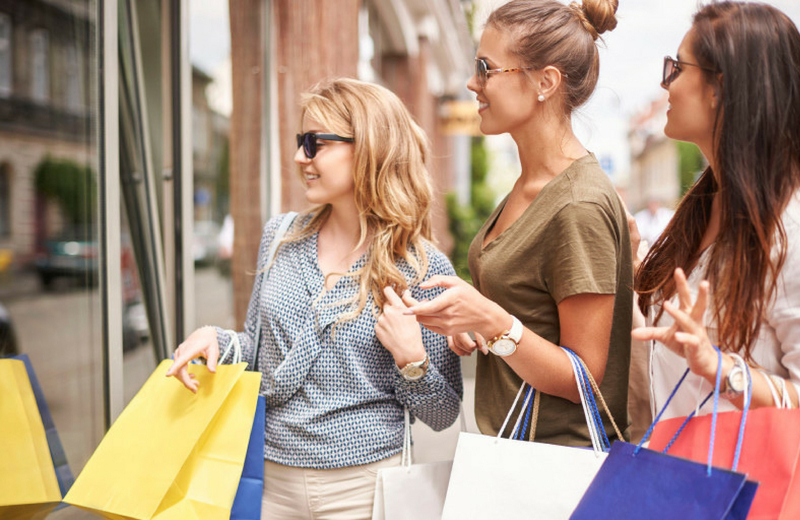 All of these fabulous shopping spots and more are within arms reach of The Palmer. Located in Englewood, part of Denver’s South Corridor, these apartment homes place you in a convenient spot next to the Inverness Business Park and Denver Tech Center. Surrounding The Palmer lies a vibrant, walkable community with easy access to the city’s finest amenities. Each home in these eleven three and four-story garden style buildings feature the highest quality of modern furnishings, creating unique living spaces like no other in Denver. Large windows offer expansive views of the city as well as the Colorado Rockies. Eco-friendly appliances help to reduce your carbon footprint. Quartz countertops accent the finer touches of both the kitchen and bathroom. No expense has been spared to create the finest in luxury living. Residents have full access to a host of carefully curated amenities designed to cater to a variety of lifestyle. Common spaces are designed to delight and entertain, more private spaces are there to relieve your stress after a long day, and both the entrepreneur and fitness guru have access to the finest accommodations. Easy access to Denver’s numerous transportation systems allows for an easy commute to both work and the beautiful nature scenes found in and around the city. You’re never far away from a green oasis or Colorado’s renowned hiking and skiing opportunities. The Palmer isn’t just another city apartment, it redefines the concept of luxury living and community. We invite you to experience all that Denver has to offer here in Engelwood, with the style and finesse only found at The Palmer. From premier shopping destinations the most breathtaking scenery, this city really does have it all. Won’t you join us? Welcome to the Palmer. Welcome to a new sense of higher, luxury living.